Beet molasses is a viscous, dark and sweet, sugar-rich by-product of the sugar extraction from the beet root (Beta vulgaris L.). Beet molasses has a toffee flavour and is very palatable to cattle and pigs. It is a major feed ingredient, used as an energy source, as an appetizer and as a binder in compound feeds for all types of livestock including poultry. Beet molasses is the syrupy by-product yielded after the crystallisation of sugar from concentrated sugar juice (see figure above)(SNFS, 2015; Crawshaw, 2004). The yield of beet molasses has been reported to be 36-40kg/tonne of sugar beet root processed (CNC, 2002). Beet molasses is rich in uncrystallized sugar and has relatively high protein content in comparison to sugarcane molasses (3 times higher). Moreover all the protein is practically digestible (Crawshaw, 2004). Beet molasses is a valuable feed ingredient for ruminants but also for pigs and poultry. Beet molasses is a sticky ingredient, useful for making hard pellets. Beet molasses allow the feed granules to stick together during pelletization: the pellets that are less likely to break down during transportation and passage through feeding equipment (Blair, 2008). Other benefits of molasses addition are a reduction in dustiness of the dietary mixture (Blair, 2008). It can also be used to ease silage process as it provides valuable quickly fermentable sugar (Crawshaw, 2004). Beet molasses can also be used to make molasses-urea blocks (FAO, 2011; Beames, 1963). Molasses is used for ethanol production and for yeast and fermentation industry (EBSSP, 2019). In the EU, 70% of beet molasses is used in ethanol production (EBSSP, 2019). 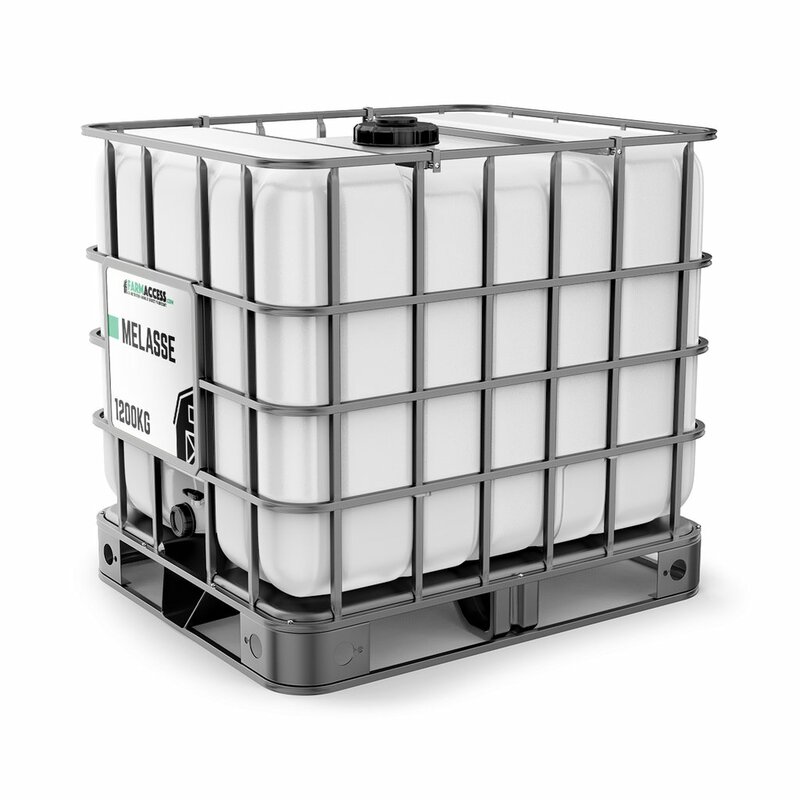 In the USA, it is added to chloride salt for de-icing roads: it is more environmentally friendly (MidWest Agri, 2019). Beet molasses is available wherever beet roots are extracted for sugar production. Beet molasses is produced worldwide. For every kilogram of sugar produced , about 285 g beet molasses is yielded (CNC, 2002). In 2013, out of a world production of sugar beet of 247 million tonnes, 231 millions were processed (FAO, 2019). It can roughly be assumed that 9 million tonnes beet molasses were yielded in 2013. In EU, more than 70% beet molasses go to alcohol and yeast production (EBSSP, 2019). 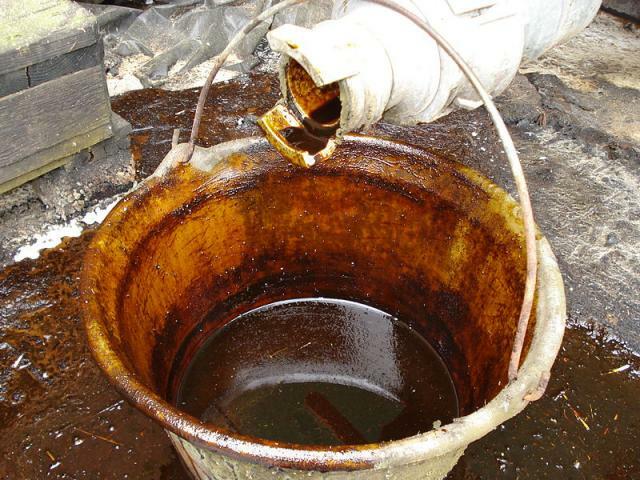 In 2006, statistics showed that about13% molasses were used as feed worldwide. Assuming a similar rate is still relevant, it can be infered that in 2013 about 1 million tonnes are used as feed worldwide (Rolet, 2005). 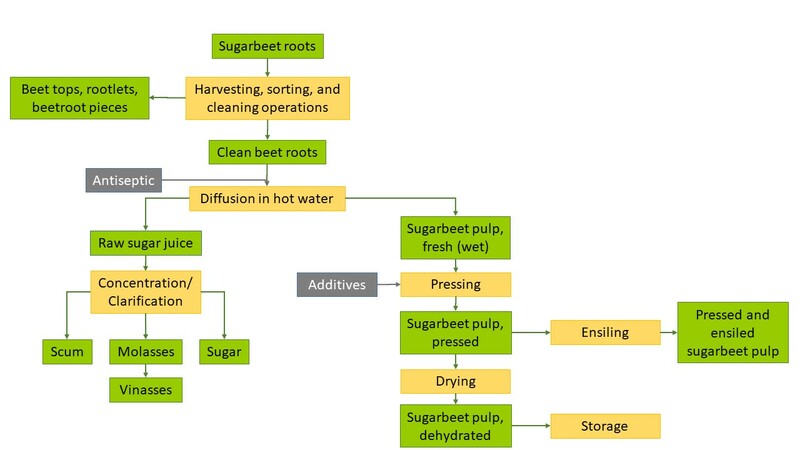 Beside the conventional process (see in Description) for beet molasses production, the Quentin process (substitution of K and Na ions by Mg ion) allows to crystallize more sugar and thus produce a beet molasse that is poorer in sugar but also richer in Mg (CNC, 2002). Beet molasses is a very viscous, semi-liquid ingredient beet molasses that requires large diameter tubes (over 80 mm in diameter) and heating during cold times for it to circulate from storage tanks to the feed mixer (Mavromichalis, 2013; CNC, 2002). In the USA, it is recommended that the temperature remain above 110 °F (43°C) while in France temperatures above 10°C are considered as the limit. Another way to prevent viscosity problems is to dilute beet molasses to 72–75% DM for sale and use on farm or in feed mills. (Harland et al., 2006). Thanks to its concentration in sugar beet molasses has high osmotic pressure and is not prone to micro-organisms contamination. However if beet molasses is diluted prior to being spread on the ration, it should not be kept more than 8 days because dilution dramatically reduces osmotic pressure (MidWest Agri, 2019; Harland et al., 2006; CNC, 2002). Beet molasses is used like sugarcane molasses. It is primarily an energy source with a very high sugar content (63.3% DM), most of this sugar being saccharose (CNC, 2002). In comparison to sugarcane molasses, it has much higher protein content (14.2 % vs. 5.7% DM)(feedtables) (Feedipedia, 2019). The protein fraction in beet molasses is completely soluble: it contains 50% amino acids with a low amount od essential aminoacid and 50% NPN. Beet molasses is rich in betain, a N compound that provides methyl groups in metabolic reactions and can thus reduce animal requirement for choline (FEDNA, 2019). Beet molasses has the same feed value as sugarcane molasses but tends to be more laxative; the amounts of beet molasses fed should be less than those recommended for sugarcane molasses (CNC, 2002). En ambos casos, la fracción nitrogenada es totalmente soluble, estando constituída en un 50% por aminoácidos (principalmente aspártico y glutámico) y en un 50% por nitrógeno no proteico. La proporción de aminoácidos esenciales es muy baja. La melaza de remolacha es particularmente rica en betaína, un compuesto nitrogenado donador de grupos metilo en diversas reacciones metabólicas. Por ello, el uso de melaza de remolacha en la dieta puede reducir las necesidades de colina. Molasses high sugar content may have deleterious effects on rumen where they cause lesions similar to parakeratosis: molasses must then be fed as a concentrate and used in combination with high fibre content roughage. The excess of potassium might have depressive effect on appetite by filling rumen with water (Bernard et al., 1991). Beet molasses is an excellent source of energy and minerals for ruminants (Daley, 2012; CNC, 2002). It can be fed in various ways and is very useful in many situations. In monogastric animals, the high levels of K and Na may cause soft faeces or diarrhoea which limits the level of inclusion of beet molasses in their diet (Harland et al., 2006). For pigs, a safe level of inclusion was reported to range from 5% in growing pig diets to 10% in finishing pig diets (Yany et al., 1982). Higher levels may be fed, although soft,dark-coloured faeces may be a problem in some intensive systems (Harland et al., 2006). In Greece, pigs could be fed on beet molasses at up to 40% dietary level (0, 10 and 30% for growing pigs; 0, 10 and 40% for fattening pigs). In growing pigs, increasing beet molasses levels had no effect on animal weight gain but increased feed/gain ratio. In fattening pigs, increasing beet molasses dietary level reduced weight gain and increased feed/gain ratio. However no diarrhoea occured, even at 40% dietary inclusion (Karamitros, 1987). In poland, it has been reported that pigs receiving a sweet drink made of water and beet molasses (16% in volume) on the day before slaughter had higher slaughtering yield and higher protein content than pigs receiving pure water (Wajda, 1997). In organic sows, it was recommended to allow 20% beet molasses in the diet at farrowing time in order to prevent constipation issues (Blair, 2007). Beet molasses fed to growing chicks and laying hens at 10% and 20% dietary inclusion respectively had no adverse effect on animal performance (Keshavarz et al., 1980). The level of inclusion of beet molasses in poultry diet is therefore limited to 10 % or less (between 2 and 6%)(Mavromichalis, 2013; Harland et al., 2006). Sugar-beet molasses are used in rabbit feeding in the same manner than sugarcane molasses. The reasons to use one or the other type of molasses are based on one hand on the price and local availability of each type of molasses and on the other hand on the search of the lowest possible potassium content (<1.8% K in the final balanced diet, Lebas 2004). In the past, this K content was frequently claimed higher in the sugar-beet molasses than in sugarcane molasses, but in fact the content of the 2 molasses types are currently similar: 5.1% on average for both with a higher variability for the sugarcane molasses (SD of 1.3% vs 0.8%). In horses, like in other livestock species, beet molasses is considered a good appetizer and an improver of pellets quality. However, in some Internet forums, beet molasses has been reported to have deleterious effects on horse health for several reasons that rooted in the history of feeding horses with beet molasses. Actually, the level of beet molasses included in the diet of horses was very high and could result in health issues (kidney stones). At the beginning of the 20th century safe level of inclusion was reduced reported to be 10.0–16.5% (Morrison, 1936). More recently, recommended feeding levels have been considerably lower than this and beet molasses is reported as a non usual feed for horses in France (Trillaud-Geyl et al., 2015). Levels of beet molasses inclusion in both forage (hay) based diets and cereal diets have been investigated. Horses and ponies were introduced over a period of time to beet molasses up to a maximum level of 1 kg/head/day. Beet molasses represented on average 10% of intake. Above this level of intake, water intake increased and faeces sometimes became soft, although this was not severe enough to cause distress to the horses (Pillner et al., 1986, unpublished observations cited by Harland et al., 2006). K and Na provision by beet molasses may be valuable for horses as they counteract the loss of eletrolytes and thus maintain osmotic pressure in tissues when the horse is sweating. Beet molasses have also been reported to have high Cr content, a trace element that could prevent insuline resistance (Aellig, 2018). It has been concluded that levels of up to 10% are probably quite acceptable (Harland et al., 2006). In Switzerland, 6% inclusion is recommended in horse diet (Agroscope, 2016). In France, 3-5% inclusion is recommended (Trillaud-Geyl et al., 2015). Agroscope, 2016. Mélasse: Sous-produit de Beta vulgaris L. (mélasse de betteraves sucrières). In: Catalogue des matières premières pour animaux, Ed. Agroscope et HAFL, Posieux et Zollikofen, Switzerland. 2 pp. Curtin, L. V., 1973. Effect of processing on the nutritional value of molasses. In: NRC, 1973. Effect of processing on the nutritional value of feeds. Proceedings of a Symposium, Gainesville, Florida, January 11-13, 1972. Washington, D.C., National Academy of Sciences, 491 p.
FAO, 2011. Successes and failures with animal nutrition practices and technologies in developing countries. Proc. FAO Electronic Conference, 1-30 September 2010, Rome, Italy. Edited by Harinder P.S. Makkar. FAO Animal Production and Health Proceedings. No. 11. Rome, Italy.